If you´re thinking of buying a house in Spain it´s important to know the Spanish purchase process is different from most other European countries. The notary´s legal responsibility is very limited and because of the decentralized bureaucratic structure Spanish property law (conveyancing) can be rather complex, especially in rustic (rural) areas. Buying a house, holiday home, apartment or other property is one of the largest investments in a person´s life and the consequences of any legal problems can be severe. Therefore it´s advisable to hire an independent lawyer/solicitor in order to conduct the very important legal investigation. If desired your lawyer can already check (or even sign on the client´s behalf) the reservation contract of the real estate agent. This short contract takes the property off the market during the legal investigation and with the signing usually a down payment is done of € 3.000 to € 6.000. Through the power of attorney the lawyer can apply for the necessary fiscal NIE number and he can set up a Spanish bank account with a bank of his client´s choice. Outstanding debts: Within the legal investigation also all kinds of possible outstanding debts are checked (mortgages, seizures, non-paid taxes, etc.) as these would automatically be transferred on to the new owner through the sale. Your lawyer can provide you with the necessary legal, financial and fiscal advice you need for your Spanish investment. This might include inheritance tax, IRNR (income tax for non-residents), 65+ advantages when selling again or the Capital Gain Tax and Plusvalia at the sale. Another subject is (holiday) rental (RTA) of a Spanish dwelling or for example starting a B&B. After the client has reached an agreement on the purchase price, there are still a lot of important terms and contingencies of the temporally private purchase contract to negotiate before completion. The lawyer will take care of all communication and will defend his client´s interests in these negotiations. As an extra service your solicitor can apply for a Spanish mortgage on his client´s behalf and arrange the obliged taxation. If the mortgage is approved, he then will arrange the signing of the public mortgage deeds at the notary which has to take place on the day of completion. Read everything you need to know about this subject in this article: Mortgages in Spain to buy property. Architectural survey of the construction: Depending on the situation and state of the property your lawyer can arrange an architectural survey for the construction by a certified architect. Technical survey for the boundaries of the land: Besides of this, for rustic properties there´s also the option to have a certified surveyor check the exact boundaries of the land. This is advisable as the registration at the Land Registry (Registro de la Propiedad) and Cadastre (Catastro) often aren´t correct (for example because of illegal subdivision of the land). Halfway during the legal investigation mostly a private purchase contract is signed, which is set up by the lawye. This contract contains important clauses and contingencies for the final sale. With the signing of the private purchase contract usually a 10% down payment is paid (minus reservation fee that has been paid before). Once the lawyer is a 100% sure that all legal requirements are met, he will arrange the necessary documentation for completion through signing the public title deeds at the notary. Tax payment: In Andalucia the transfer tax ITP is 8% up to € 400.000, or 10% IVA/VAT should be paid when buying a new build property. Registrations: Correct registration of the property and the land at the Land Registry & Cadastre. Service contracts: Changing service contracts plus corresponding direct debits of electricity, water, IBI (yearly local real estate tax), owner´s association (comunidad), etc. Arranging the signing of the purchaser´s Spanish wills (testaments) in which the buyer declares that he want his personal / national law to apply (advisable for both non-residents and must-have for residents). More information about Spanish wills and the Spanish inheritance process you´ll find in the chapter inheritance law. It´s very important to make sure that the legal investigation is carried out thoroughly and correctly by a specialist in property law. A lawyer is the only professional with the right education, work experience, official board membership for lawyers and professional liability insurance. It´s his obligation to inform his client about all steps in the process, the exact buying conditions and all possible risks concerning the purchase. Besides of this, based on his experience a lawyer know exactly how to deal with administrative irregularities and can solve most problems that might surface during the legal investigation. The following video of out Dutch client Mister Boeijen shows his experiences with the problems a lot of house owners currently have in the countryside of the Axarquia due to legal or administrative shortcomings. 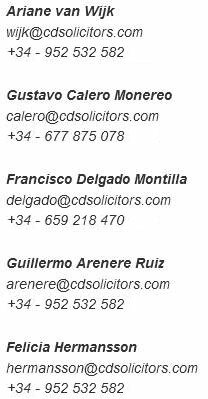 C&D Solicitors is based in Torrox on the Costa del Sol in Andalucia. Our main work area is the Axarquia (eastern part of the Malaga province with towns like Nerja, Frigiliana, Competa, Viñuela, Velez-Malaga, Arenas, Alcaucin, etc. ), but we offer our services for buying a house in the whole of the Malaga province and the rest of Andalucia. Please feel free to contact us if you have any questions or if you are interested in a first (free) meeting in our office.